The fine art at the New Zealand and South Seas Exhibition in Dunedin. Photo: Uare Taoka o Ha-kena – Hocken Collections, P1997-032/5-049a. It is rare for a blockbuster exhibition to get closer to New Zealand than Melbourne. In 2019, though, art lovers can at least look forward to a feast of works by our most famous expatriate painter, Frances Hodgkins, as galleries around the country mark 150 years since her birth. Interestingly, it was her father, William Hodgkins who, along with a small band of associates, organised the first of these monumental events in the summer of 1889-90. While long past living memory, enough documentary photographs survive at the Hocken for us to conjure a vivid picture of how it must have looked. As president of the Otago Art Society, William Hodgkins had the task of organising the fine art at the New Zealand and South Seas Exhibition in Dunedin. In addition to gathering a collection of paintings and etchings from around New Zealand, he managed to secure a selection of British works already shipped to Australia for the Melbourne Centennial International Exhibition in 1888. 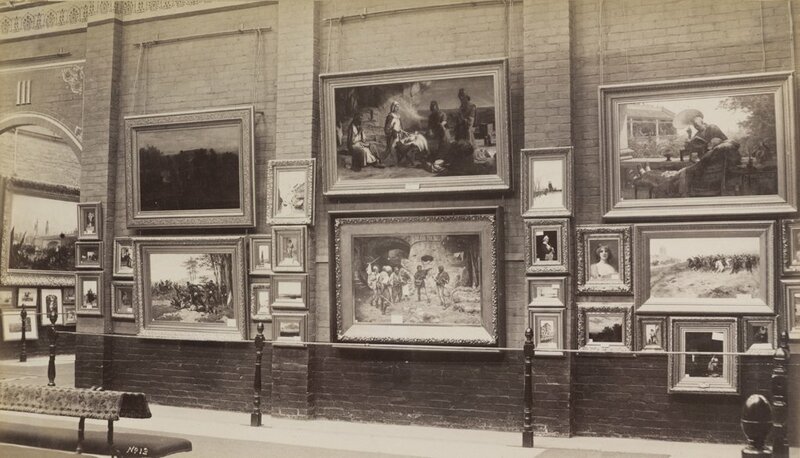 It was a survey show of more than 100 sizeable paintings, heralded in London as the finest assemblage of pictures of the English school that had ever left those shores. The works ranged from oil and watercolour landscapes by Constable and Turner to allegorical genre scenes by Leighton and Millais and examples of the rural, realistic Newlyn School such as Stanhope Forbes' Preparations for the Market, Quimperle, Brittany. In Dunedin, the paintings hung in six large rooms with a stud of 18 feet (5.5m), located in the southwest corner of the sprawling, purpose-built pavilion near the waterfront. Some of the official photographs taken by D.A. De Maus are currently on show at the Hocken Gallery as part of the exhibition "Hand in Hand: Photographers and Painters Alike". Scans projected on to a wall alongside some of the actual works give a sense of the scale of the venture. Over the course of five months, 625,000 people visited the New Zealand and South Seas Exhibition, making it a sensational success, given Dunedin's population was under 50,000. Some people had season tickets, and the event had lasting consequences for the region. William Hodgkins and his friends organised the purchase of a selection of the paintings for the benefit of future generations of artists and as a foundation collection for the new Dunedin Public Art Gallery. This act of philanthropy impressed Mark Twain when he visited Dunedin in 1895, and Hodgkins guided him around the museum and public gallery. Twain wrote in Following the Equator: "All over Australasia pictures by famous European artists are bought for the public galleries by the State and by societies of citizens. Living citizens not dead ones. They rob themselves to give, not their heirs." Charles Gassiott, of London, also generously gifted Adoration of the Magi, by J.R. Herbert, to the city, which made a great Christmas present. Anna Petersen is curator of photographs at Hocken Collections.